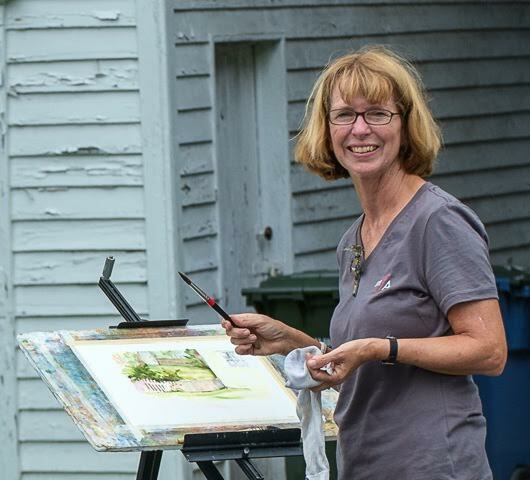 Stacey Sass at Plein Air Easton – Note the MFA shirt! ME: One of the many wonderful things about being a resident of Annapolis is the enthusiasm and support this town has for the arts. I have lived in Annapolis for 30 years and taught art during that time at Old Mill and Broadneck high schools and earned a Master’s in Fine Art from MICA. After working in clay for 20 years, I switched to 2D art and found that watercolor was the perfect match for my aesthetic goals and lifestyle as a boater. MY ART: Plein air painting is my passion and many of my pieces (such as the one here of the Eastport bridge) were completed while anchored in my 17- foot Whaler. During Paint Annapolis 2014, I fell overboard while setting the anchor but then climbed back inside the boat and completed the painting. A spectator at the quick draw exhibit looked at my completed painting and commented, “your painting style is so fluid”…she had no idea how apropos that critique was! As a recent retiree, I have more time to dedicate to my painting but still enjoy teaching private art lessons and have been hired to judge shows and give art history presentations to art groups. 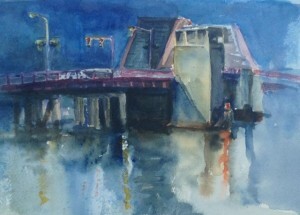 As a member of MAPAPA, the Annapolis Watercolor Club, and KIFA, I have participated in many shows and won 3rd place at this year’s Paint Annapolis nocturne public event and 3rd place in the 2011 Paint Annapolis’ MAPAPA members show. I don’t have a website… yet. I’m going to take advantage of the MFA member portfolio very soon. MFA & ME: I am most impressed by the high aesthetic standards and diversity of imagery in the MFA shows and feel that the organization has become a premier art association in the Mid-Atlantic area. While volunteering at recent MFA events, the quality of dedicated, intelligent artists associated with the organization was evident. I am also thrilled to boast that I was the high school art teacher of MFA’s awesome Gallery Manager, Hannah Sturm! and I am one of her collectors!